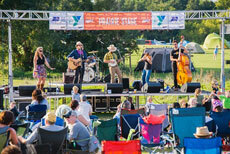 Hudson, WI—The YMCA of the Greater Twin Cities, a leading nonprofit dedicated to strengthening communities through youth development, healthy living and social responsibility, will co-host the third annual Prairie Burn Music Festival with the Royal Credit Union Foundation on September 16 at Camp St. Croix in Hudson, Wisconsin. This one-of-a-kind event will feature music on three stages, camping hosted by REI, and activities for all ages and interests, including counselor-led camp games, rides on a giant swing and hayride tractor, access to the archery range and climbing tower, and an option to join in clogging, hula and swing dance lessons. This year’s musical lineup includes Cloud Cult, Koo Koo Kanga Roo, The Honeydogs, The Ericksons, The Bootlicker Stringband, Afton, Wailing Loons, Hamdog, Dusty Heart, Prairie Fire Lady Choir, Julia Floberg & Company, Ruben, The Hawthorn Collection and special programming from 89.3 The Current. A variety of food trucks will join the festivities, and Rush River Brewing will create and present several custom brews. Tickets: Tickets available online at ymcamn.org/prairieburn. Adult tickets are only $35. Two kids 15 and under enter free with every adult. Individuals can attend the Prairie Burn Music Festival for free when they volunteer at the event. More details are available at ymcamn.org/prairieburn or on Facebook. The YMCA of the Greater Twin Cities is a leading nonprofit dedicated to strengthening communities through youth development, healthy living and social responsibility. Established 161 years ago, the Ys provide life-strengthening services across the greater Twin Cities metro region, southeastern Minnesota and western Wisconsin communities. The 29 Y locations and program sites, seven overnight camps, 10 day camps, and more than 90 child care sites engage more than 350,000 men, women and children of all ages, incomes and backgrounds.